Urine can vary a lot in color – normally we see anything from a bright yellow to a clear colored liquid, but if you see that your urine has turned black, it can be very frightening. However, as with other colors of urine, there are many reasons for it to turn black – some are serious and some are not. In order to understand where black urine comes from, it’s important to know how urine is produced. The water we drink is absorbed from the digestive system into the blood. 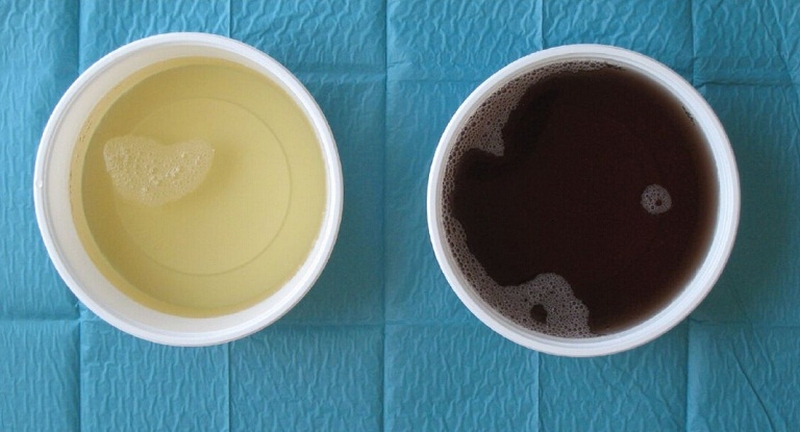 Excess water and waste products in the blood are filtered by the kidneys. This water and waste then passes from the kidneys to the bladder via small tubes known as the ureters. Finally, urination occurs when fluid is released by the bladder through another tube called the urethra. Therefore, whatever has caused the urine to change color will be associated with the production and/or passage of urine. Generally, black urine may be caused by three predominant types of reasons as we list below. Aloe. Although it’s best known as a skin tonic, some people drink aloe tea or aloe juice. Aloe contains certain acids, which if taken in large quantities, cause black urine. Whilst aloe juice is not considered dangerous, aloe sap contains a chemical called aloin, which may cause kidney disease, so it should be avoided. Fava Beans. These beans, also known as broad beans or horse beans, contain high amounts of a compound called L-DOPA. Although people naturally produce L-DOPA inside their bodies, large quantities will cause urine to turn black or brown. Rhubarb. This vegetable is well-known for changing the color of your urine. Small amounts make your pee turn orange, whereas larger quantities can leave you with black-colored urine. Sorbitol. Sorbitol is a sweet-tasting molecule found naturally in fruit, including pears, peaches, prunes and apples. It’s also used as a sweetener in products such as sugar-free gum, soft drinks, ice cream, cough syrup and mints. In addition to black urine, excess sorbitol can cause abdominal pain, diarrhea and stomach upsets. The chemicals you use and medicines you take may have an effect on the color of your urine and can be dangerous for your health. The list of medication causes of black urine is quite long, so whatever you are taking, always read the information leaflet regarding side effects. Here we list five common medicines that can cause the black urine. Iodine. Betadine solution, containing povidone iodine, is used for cleaning wounds. It’s also commonly applied to the skin before operations, and can be used as a cough medicine. However, too much Betadine in your system can make your urine turn black. Anti-Malarials. Chloroquine and primaquine are anti-malarial drugs that may change the color of your urine. Chloroquine is also an effective immunosuppressant for treating lupus and arthritis, whilst primaquine can also be used for pneumonia patients. Senna/Cascara. These common stimulative laxative agents can cause darkened urine, which may appear dark yellow, brown, or black in color. Chronic use of these laxatives can also damage your liver. Phenol Poisoning. This is contracted through contact with disinfectants, for example, not washing your hands after cleaning, or not using gloves. The phenols from cleaning chemicals are oxidized to hydroquinone and pyrocatechol, causing a condition called carboluria, with green or black urine. Methocarbamol. This is used as a muscle relaxant – often prescribed in addition to physical therapy and/or rest to treat skeletal muscle spasms. It’s usually sold under the trade names Rabdolax, Robaxin, or Robaxisal. Black urine can also be a symptom of many different health problems. Whilst some health causes of black coloured urine are minor, others could be life-threatening, so it's important to see your doctor as soon as possible. Blackwater Fever. This is often seen as a complication from malaria treatment. During the illness, there is a large breakdown of red blood cells. This releases red hemoglobin pigments, which are passed through to the urine, turning it red or black. Alkaptonuria. This is a recessive genetic condition where the body doesn’t produce enough enzymes to break down the amino acid tyrosine. This causes buildup of a by-product known as homogentisic acid. Urine containing homogentisic acid turns a variety of colors, including black, if left out in the open air. Melanogen. After exposure to the sun, the body releases melanogen, a precursor to the molecule melanin, which makes your skin tan. Although melanogen is colorless, excessive quantities may end up in the urine, where it is converted to melanin. Melanin can turn the urine black or brown when it is exposed to air. Porphyria Cutanea Tarda. There are many types of porphyria, and the most common type, porphyria cutanea tarda, can lead to black urine. The condition is characterized by an enzyme deficiency, resulting in colored porphyrins accumulating in the liver and the urine. Patients may also get blistered skin after sitting in the sun. Cancer, particularly in the kidney, pancreas, prostate or bladder. Injury to the urinary system. Wilm's tumor – a childhood cancer of the kidney. Liver disease, including cirrhosis, liver failure and hepatitis. If you think you may have any of these conditions, make an appointment to see a doctor as soon as possible. Server responsed at: 04/19/2019 4:32 a.m.